Adjusts to maximum fireplace opening of 58"
This Woodfield Hanging Fireplace Spark Screen Rod Kit - 61090 is designed to work with any of the sizes of Woodfield Hanging Fireplace Spark Screens. The set includes two adjustable rods and center section for the rods to go through. 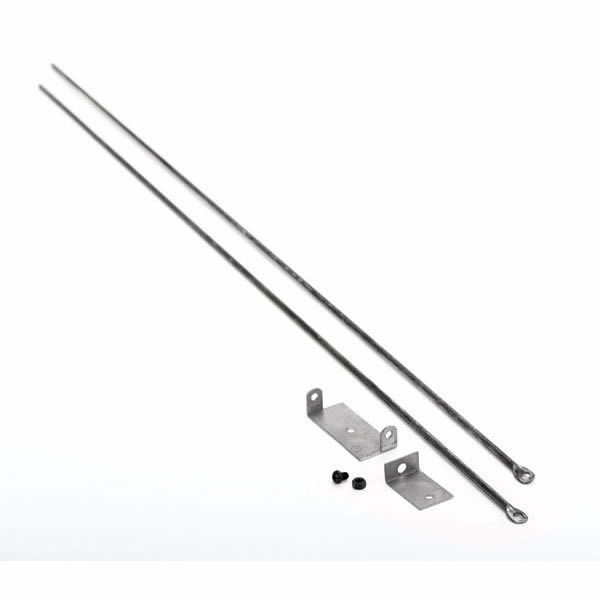 Each rod collapses down to approximately 32 inches, and the pair can expand to accommodate fireplaces up to 58 inches in width.Note* Unit does not include side mounting brackets due to the variety of materials used in firebox construction. Side mounting brackets can be obtained at a local hardware store. Can this kit be installed on the inside of the fireplace opening? Yes, this product is meant to be installed inside the fireplace opening. Please view this installation manual for clarity. How much space does the rod take up? It uses approximately 1 1/2" of space. Installation is simple. You would just need to supply the masonry anchors and mount the rod with the included brackets to your fireplace to complete installation. The rods can adjust to fit a fireplace up to 58" wide. Can I attach this to a brick fireplace? Yes, you would just need to supply the masonry anchors and mount the rod with the included brackets to your fireplace to complete installation. Rod would not support weight of curtain. No instructions were included. Ended up buying steel rod and made custom brackets to hang the curtain. Got the package promptly. Like eveyone else, no instructions. What's that little black screw & nut for? Downloaded rod assy. instructions off the website. Too vague to comprehend. Should show pics of final installation. As of now it's still sitting on the hearth. You have to bend the ends to attach them to the Fireplace frame. The first end bent just fine. The second end broke right off. Lucky for me I bought a back up, so no worries. then I tryed to slide the poles through the provided brackets. Out of the four (4) poles I had, only one would slide through the holes. Again, of the provided brackets. Totally useless. All the work I did, I had to undo. To everyone else's point on this website this little package arrives with absolutely no instructions! I also have to think based on all of the research we have done trying to figure this out it seems most people do not actually have whatever it is they assume you already have for this (mounting brackets) so now we are on a hunt for some sort of magical brackets which dont seem to exist to install this. I cant really rate this fairly since we haven't been able to install- but it seems ok... Someone just needs to speak with this manufacturer to have them start sending along instructions!! I wish they were a little thicker/sturdier. It is what it says it is. The spark screen rod kit. I was prepared for the worse as it seemed so basic but did say I may need to purchase additional brackets to fit. I was able to install with what it came with. Cut the rod down to size with a hack saw. Screwed the brackets right into holes I drilled into the metal fire box and installed the screens (also purchased here) in about 1-2 hours. I say screens becuase I installed two of these in a double sided fireplace. The previous owner didn't installed the very overpriced (in my opinion) glass doors and opted for standing screens, while nice, blocked the fireplace view and marble cladding. We wanted a more streamlined look. These rods made it happen. Unfortunately because the bracket provided is so big, the screen when closed is almost two inches apart in the middle. We have been looking for new smaller brackets to replace the ones that came with, but have not had success yet. We're very disappointed in the design. ProsIt was easy to install. ConsIt's not designed well at all. This is a very affordable accessory. I originally bought it so our fireplace would look complete, but did not realize how hard it was going to be to install it. To begin, there were no directions in or on the box. Eventually, after a great deal of searching, I found some simple ones online. Then, the piece does not come with screws, so I had to find them separately. I would be willing to pay extra for the convenience of having everything I needed in one package. Once I had the screws and directions, I did not have too much trouble putting it up. Inferior product - rod sags when supporting weight of curtain and bends flimsy center hangar. Rods only span 41", and curtains are made of standard woven mesh material. Do not recommend.